The Claudia Nance Rollins Building opened in 2010. 2010 saw the opening of the Claudia Nance Rollins Building, funded by a $50 million gift from the O. Wayne Rollins Foundation and Grace Crum Rollins. Dean James Curran tells the story behind the building. Emory University has been awarded a prestigious silver level LEED (Leadership in Energy and Environmental Design) certification by the U.S. Green Building Council for the Rollins School of Public Health's Claudia Nance Rollins (CNR) Building, which opened in 2010. LEED is the nation's preeminent program for the design, construction and operation of high performance environmentally efficient buildings. The eight-story CNR Building, located at 1518 Clifton Road in Atlanta, meets certain high standards for indoor air quality, energy and water conservation. Many of the materials used in the building are recycled, renewable or locally sourced materials. "We are proud to receive this outstanding award," says James W. Curran, dean of Emory's Rollins School of Public Health. "This building is not only a shining example of our dedication to public health because of the work happening inside of it, but the structure itself clearly shows our commitment to providing a healthier environment for residents, workers and the larger community." CO2 monitors placed in densely occupied areas to verify that enough outside air is supplied where needed. Exemplary performance in water use reduction achieved through the use of water conserving, low flow plumbing fixtures including low flush urinals, dual flush water closets and low flow lavatories. Environmental rooms in the laboratories are cooled using return water from the chilled water system instead of a single pass water cooling system. Reduction in energy use is realized by high efficiency lighting and HVAC systems and by utilizing variable speed motors and occupancy sensors. An enthalpy wheel is used to minimize energy use in laboratories. During construction the project diverted over 80% of construction waste from landfills. 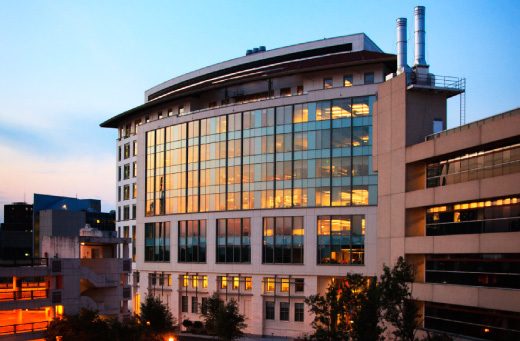 Emory holds the distinction of having one of the largest inventories by square footage of LEED-certified building space among university campuses in America. Many buildings on campus have attained LEED certification ranging from Certified to Gold levels, including the first certified Gold LEED-EB (existing building) in the country, the Goizueta Business School in 2004, and the first LEED-certified building constructed in the Southeast in 2000 (Whitehead Biomedical Research Building). The LEED program was established to promote environmentally friendly, whole building design practices. Designers are encouraged to think in new and different ways to help create buildings that will conserve energy, water, and the project site's natural environment.